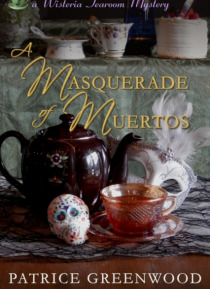 Despite her desire to make the Wisteria Tearoom a haven of tranquility, Ellen Rosings can't rid her parlors of the shadow of death. Fascinated with the tearoom's resident ghost, her customers flock to spirit-tours-with-tea, and to crown all, the office manager and her Goth friends plan a Halloween masquerade recreating a classic horror story.Between his heavy workload and his fits of jealousy when… Ellen looks at anything male, Detective Tony Aragon can't offer her much comfort.Are the flashes of light she's been seeing some kind of message from the spirit world? Or is it just coincidence when a body turns up where she last saw a gleam?